Is your tow vehicle up to the challenge of pulling a trailer filled with your trail partners? Here’s 10 things to know before you tow. Check your lights. All of your lights. 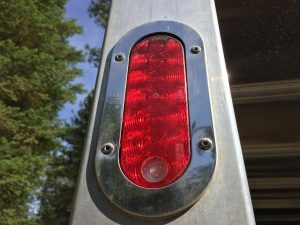 Properly operating lights on your truck and trailer not only help you see what’s coming up but also let others know what you’re doing or going to be doing as you slow down, stop, and turn. Confirm that your towing vehicle’s lights are operating properly then check the trailer lights as well. Ensuring that all your lights work (headlights, high beams, turn signals, brake, and running lights) will help keep you and your precious cargo safe. If your lights are not operating properly, have them repaired or replaced before you load and go. I’ve found that wiring harnesses, especially the connections from truck to trailer, tend to fail as they age. The standard 7 blade plugs can wear and become loose. When this happens not only can your electrical connections fail, the plug can even fall out of the socket. Not a good thing to happen when you’re on the road. 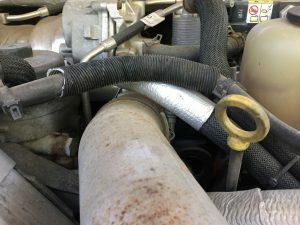 I prevented these failures by replacing my trailer and truck plugs and sockets with those from EZ Connector. 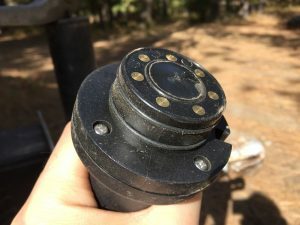 These bladeless trailer connectors use rare earth magnets to ensure a reliable and trouble free connection every time. Are your tires ready for the journey? Heavily worn tread will prevent a tire from performing as designed and can lead to unsafe driving conditions. Frequent checks, and tire replacements when needed, can prevent a hazardous blow-out during a trip. One of the simplest ways to check tread depth requires nothing more than a penny and a few moments of your time. The idea of the penny test is to check whether you’ve hit the 2/32” threshold. In the US, tire tread depth is measured in 32nds of an inch. New tires typically come with 11/32” tread depths or deeper. 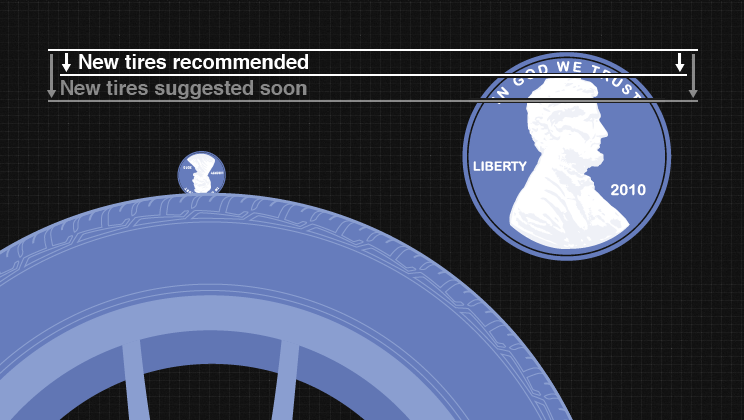 The U.S. Department of Transportation recommends replacing tires when they reach 2/32”, and many states require tires to be replaced at this depth. See how much of his head disappears between the ribs. If you can see his entire head, it may be time to replace the tire because your tread is no longer deep enough. Blowouts are doubly dangerous when they occur during towing. If this happens, stay calm and get off the road as quickly as possible. 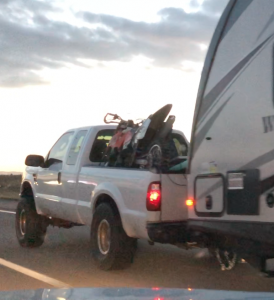 Always be sure to carry a spare vehicle and trailer tires with you. 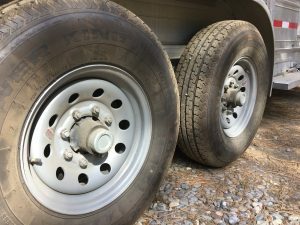 Check that all your truck and trailer tires are properly inflated by following the guidelines in your vehicle’s user manual. Your Mirrors – a Crucial Tool! Visibility can be a challenge when you’re towing. When you’re hauling horses you’ll often only have use of your side-view mirrors, making them a crucial driving tool. 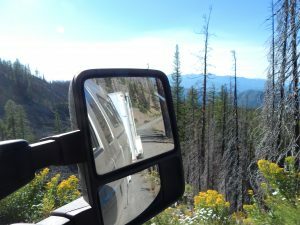 Your mirrors require proper adjustment to ensure a full spectrum of vision and prevent blind spots as much as possible. Knowing how to set these outside mirrors to eliminate blind spots is a crucial part of being a defensive driver. To adjust the passenger’s side-view mirror, position your head so that it is just above the center console. Set the mirror so you can just barely see the side of the car in the left side of the mirror. If the vehicle is not equipped with remote mirror-adjustment controls, you may need assistance when properly positioning the mirror. With these settings, you will have nearly seamless visual contact around your vehicle, which can help you detect the presence of nearby drivers. For example, when being passed by a vehicle in the lane to your left, you will see it progress from the left side mirror and then to your side vision. Is your tow vehicle ready for your load? If you tow a trailer, it’s a good idea to make sure your tow vehicle can handle the load. Unfortunately, it’s common for drivers to use inadequate vehicles or hitches, which result in unsafe driving situations. It can be easy to hit the payload limit on many trucks if you’re towing heavy loads. Especially with the crew cabs that are so prevalent, it’s tempting to load up the crew, all their gear, and not have enough payload left over to handle the tongue weight on a big trailer. Check your fluids and transmission. When you’re towing trailers, you should be following the severe maintenance plan from your vehicle’s owner’s manual. The added weight inherent in towing adds stress to the towing vehicle, causing it to run hotter than normal. Since your truck will be working much harder you’ll want to check and replace fluids more often, including motor oil. Consider using both synthetic motor oil and transmission fluid for added protection. Also check and change your oil filters often for optimal performance. Also make sure that your transmission is in good shape. I’m not mechanically inclined so I have my local mechanic handle these checks for me. When you’re hauling, you’ll need more stopping distance and so having brakes that are worn could be a hazard. So, make sure your brakes are in good working order so that the extra weight that you’re hauling behind you can be stopped safely. Have your truck and trailer brakes been checked recently? Don’t ride the brakes; if you do, you might overheat them (and trust me smoky brakes are not a good thing!). When driving downhill, drive at a reduced speed using a lower truck gear if necessary. Use your brakes to slow enough to catch that lower gear. 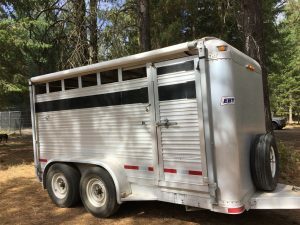 Most horse trailers come with their own braking systems that need to be connected to your vehicle to operate properly. Although it takes a little skill to coordinate the brake controller, trailer brake systems equal less stress on the towing vehicle’s brakes. The main thing to keep in mind is, with a trailer, your stopping distance is longer. You want to maintain a larger than normal distance between you and the vehicle in front of you, so that you have plenty of time to stop. Give yourself more plenty room than you would normally allow and don’t trust the intuition you developed when driving a smaller and lighter vehicle. Each piece of towing gear comes with towing capacity limits. 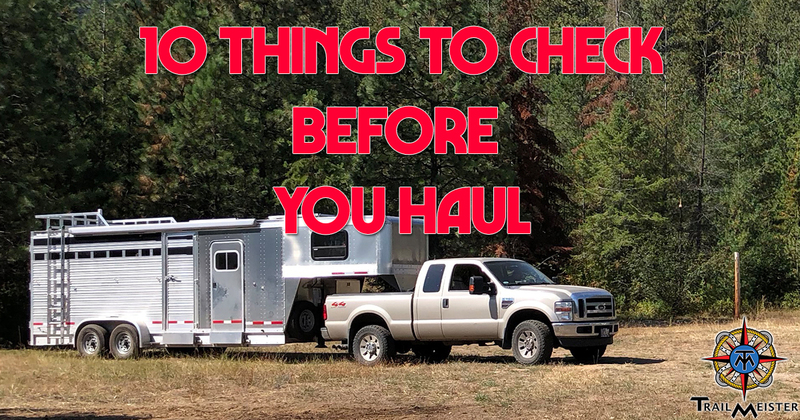 Double check that the equipment you have is suitable for what you plan to tow. Make sure that the chains you use are sufficiently strong for the weight that you’re towing. 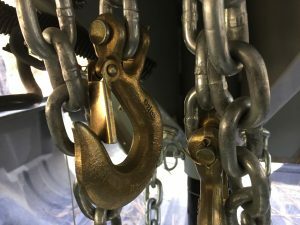 When choosing chains, make that they are long enough to allow the trailer to turn easily with your towing vehicle, but short enough to not drag..
For bumper pull trailers, when you attach the safety chains to the vehicle, criss-cross them underneath the trailer’s tongue. 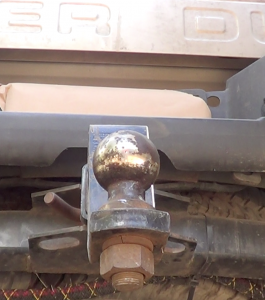 That way, if the trailer comes unhitched, the tongue will be cradled on the chains instead of hitting the ground. Is your fuel enough for your route? Your towing vehicle is going to use more fuel when you tow. A lot more fuel. This means that you’re most likely going to be pulling into gas stations more often. 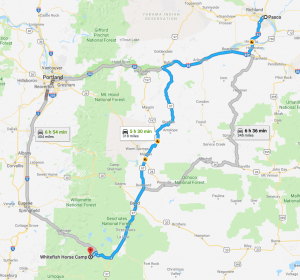 Plan ahead to find truck stations that are designed for larger vehicles to get into and out of easily. Also try to avoid stop and go traffic since that makes your truck work harder and use more fuel. It’s important to know how tall your trailer is. The last thing you want to do is have an accident by trying to drive under a bridge that is too low. Find out your height, then add a foot just to be sure, and avoid any passage marked with a lower clearance than that value. Well there you go! Just a few minutes of preparation to help ensure that you have a safe journey with your horses in tow.